The scores have been tabulated and the results are in: the overall winner of the minimalism-themed Ludum Dare 26 72-hour Game Jam is Leaf Me Alone, a retro Metroidvania-style platformer by Mark Foster and David Fenn. Now, "minimalism" and "Metroidvania" aren't two words that usually go together (except, you know... alliteratively), but Foster and Fenn have put together a wonderful little world for a pixelated-blob-type-thing to explore. You'll be moving said pixelated-blog-type-thing with the [arrow] keys, using [Z] to jump. Exploration is when much of the game's charm lies, but suffice to say, throughout you'll be discovering new areas and abilities, all the while trying to unlock that strange gate near where you started the game. Works like Fez, Melodisle and Proteus have shown that the thrill of uncovering new vistas is no less intriguing even if said vistas are low-rez, and Leaf Me Alone continues that tradition. Leaf Me Alone is a relaxed, quiet kind of experience, more about the journey than the destination, with an almost-poetic feel. Some parts of the game are a little aimless from its lack of explicit direction, and it could use a few more visual cues to distinguish platforms "pass-through-able from below" from the "ones-you'll-clonk-into" variety. Still, Leaf Me Alone is a solid winner, and going on the trip it offers won't leave players too... sigh "bushed". Leaf Me Alone Walkthrough now available! Well, since no one else has tried one, I guess I'll make it. Since the game is so simple, I'm not sure if this a good idea or not, but I don't care. Once you reach the top of the tree, (as you climb, the music quiets, which I like :)) you'll find a leaf, and the instructions to use it. just press z while in the air to parachute down. You can fall down any distance to a platform (as long as it's on the same screen) without getting hurt, even when not parachuting, but with the leaf, you can reach distances that are otherwise impossible to get to. One of these is the second tree to the right, where you can find a bright blue square. These are important, so collect it. If you explore a bit(which I implore you to do), you'll find that the square you found reacts to the stone door, but nothing else happens. Also, if you go all the way to the left, you'll find another tree flanked by wooden struts. You can't go inside yet, but remember it. When you're ready, climb up to the top of the second tree to the right, or at least as far as you can go. The game shows you that you can press up to go in any doors you find. Ok, that's pretty standard in games. Go inside. Once inside, you'll find a great game mechanic- Gust Flowers! (that's what I call em, anyways.... there's also a few worms here, but they don't bother you.) Here, you must climb up to the Gust Flower and open your leaf parachute. When you reach the peak of the gust, press and hold right. If you were high up enough, you should be able to land on the block. now go down to the right and press the button. This will cause the gate on the left to open, so go through and use the Gust Flower there to go up. Above that Gust Flower is another one, which pushes you against the ceiling. Don't worry, it's quite safe. Anyway, float over to the other Gust Flower on the right. You should be able to just make it, unless you fool around too much. The way up to the next ledge is tricky, but if you float from the very bottom of the Gust Flower, you should be able to make it. The next area is bit confusing. You obviously can't get to the door on the left, because it's gated and the button to open the gate is too high to reach.... for now. Just leave it alone and use the Gust Flower on the left to reach the one on the right. Again, you should be able to just make it. Float up from the very bottom of this flower to reach a button which opens the gate directly above you. However, the ledge it's on is too high for you to get to directly, so you'll have to go around. go back to the left Gust Flower, above the currently inaccessible too-high button. Going up, you should find a bunch of small leafy platforms leading up. Yes, you have to climb up them. Don't moan, it's easier than it looks, and you can salvage a jump with your leaf. Once you get to the small platform, jump off to the right, towards the Gust Flower. This is another one of those "just make it" jumps. There's quite a few in this area. Anyway, float up to the ledges and climb up to the button. Press it, opening a gate above you, where you can see a Royal Squirrel, and drop back down. Did you open the gate near the three Gust Flowers like i told you? if not, go back and do that now. Go through the gate and jump onto the first leafy platform with a Gust Flower on it. Now, this next part is tricky, so pay attention: You need to go from the very bottom of this flower and bob and weave your way through the other ones. If done correctly, you should've gained enough height to land on the Royal Squirrel's throne ledge, but you likely won't do this on the first try, so just keep trying until you can. The only hint I can give you here is to catch each Gust Flower as low as you can. the fact that the leafy platforms are one-way will help. Go to it. Once you've made it to the Royal Squirrel's throne ledge, you may be disappointed that you can't talk to it. 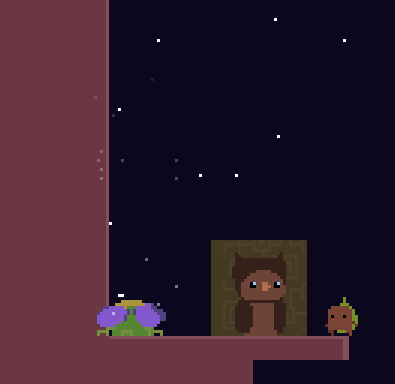 Oh well, just jump or glide over to the Gust Flower and use it to get to the door above the Royal Squirrel's throne. This one can take a few tries, too, but thankfully it's easier than before... leave the inside of the tree through this door. Be careful, because this is the first area where you can fall to your death. Thankfully, there's no game over, and you just reappear at the last platform you were standing on. Anyway, make your way to the tree on the right side of the area, using a another game mechanic: Clouds! These will wait a little while, then blow forward for a few seconds before stopping to wait again. there are also non-blowing clouds (without faces) that you can stand on. Utilize them wisely. As you go to the right, you'll reach a group of three Platform Clouds arranged at points of a right pointing triangle, with two Gust Flowers, one right below the other. use the lower one to get blown high upwards, and try to time it so the Blowing Cloud is doing his thing. Hold right as soon as you see him, and you should be able to make it to the next Platform Cloud, close to the tree you want to climb to the crown of. Ignore the Blowing Cloud and use the Gust Flower to do so. Once on the crown of the tree, jump to the Platform Cloud with the Gust Flower on and glide to the dead tree. 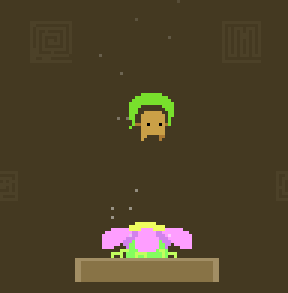 Jump down to the next Gust Flower and ride it to collect a seed. what type of seed, you ask? Well, press x and find out. Yep, it's a Gust Flower seed! This will be useful... Anyway, hop back down to the door and go in. There is nothing else to do here. With the Gust Seed, you can now reach that button which was otherwise out of reach. Make a beeline for the area, and drop your seed. (Don't worry, whenever you drop it, your Gust Flower gets teleported to wherever you are at the time) Use your gust flower to fly up and press the button, then leave through the door you just opened the way to. What's this? It's nighttime? Yes, your journey has taken an entire day. Anyway, there's a bright green square just below you, so hop off edge of the branch and float down to it. Use your Gust Seed and Gust Flower to get back up and reenter the tree. Just make your way down to the bottom and exit. Remember you can fall any distance without getting hurt. Yep, it's still night time.... You may think you have all the squares, but when you check the door, it's apparent you still need one more. Remember that tree with struts? Now that you have the Gust Seed, you can go in. First, use your Gust Seed to get to one of the lower ledges. It doesn't matter which. Once on there, use it again to get the middle ledge, then again to get to a higher ledge. Now, you'll see four gates, one horizontal. Sorry to say, but that one opens last. Anyway, drop your seed again to reach the only accessible button and press it. Return to the middle and go towards the next accessible button. Repeat this sequence until you've opened the horizontal gate. Once you have, float over to the first button and drop your seed right there. Place your seed again once on the one-way platform above and glide to the highest middle platform. You should be able to see a bright red square. Drop your seed again and ride your gust plant to collect it. Then you can leave. Once you're back home once again, approach the large stone door. reacting to your squares, it opens. Go in. "Now I can be alone"
Once inside, you'll find some butterflies, a worm, five birds, and the Royal Squirrel. They don't bother you, and you can't bother them. Drop your seed once to reach one ledge then again to reach the middle ledge, where, carved into the wood, is a drawing of a stickman, a few leaves and the words "Now I can be alone." Stay here for as long as you wish, then leave, and the game will start over. "Now I can be alone." I liked it. Reminded me of a stripped down version of Fez. I know, and YOU know, how much time you spent on sound design and really: bless you for it because sound is neat and we have ears. Sometimes, though -- sometimes, Game Designers, I want to mute your sound design. Maybe I'm at work and shouldn't be playing your game in the first place yes, I know, I GET IT. But maybe I'm at work or maybe I'm listening to this song on auto-repeat (http://youtu.be/PXkc2GLPl6I) and I can't have your well-crafted sound track and my current choice of self-soothing music on at the same time and I know me better than I know you, Game Designer, so I'm going to go with what I need, which is Olafur Arnalds and Arnor Dan. I guess the tl;dr version is: Please give me a mute button. The platforms upon which the fan flowers in the tree rest can be passed through from beneath. With this in mind, it's much easier to go back and forth between the three in sequence to get to the top. little star and the owl? nevermind.. now im stuck at the place where im just on a tree branch.. what do i do? I opened the gate at the beginning of the game, and now it says I can be alone, and I'm in there with some squirrel royalty. Is that it? Is there some powerup early on that can add more oomph to my jumps? I keep running into spots inside the tree where I can't jump high enough on my own & there aren't any fans to give me lift. This is/was a really beautiful game. The music was wonderfully crafted and the low-rez atmosphere seemed to flow very well. I would love to see more in depth works from Mark Foster and David Fenn. If the creators of "Leaf me Alone" were to read this, my only feedback (given that this was indeed a Ludum Dare entry,) would be the message in which they were trying to convey. The only two pieces of text that we receive is at the start and at the end; which conveys that the protagonist simply just wants to be left alone. While the idea is good, the only thing I would suggest is to have further reasons why the protagonist would want to be left alone. The game play itself shows no outstanding reason of WHY the character wants to be alone. If there was more contrast of the atmosphere in comparison to the main character's goals, perhaps the ending would have been more gratifying. IE: The squirrels in the right tree are having a saxophone jam session. or the tree on the left: The loud buzzing of busy bumble bees. Essentially, anything that would create a sense of chaos in the protagonist's mind. Reinforce the ideas and goals of the main character by adding contrasts of the world around him. That aside I still really enjoyed the game. Keep up the Great Work! above the three in which you find the last white block, is some sort of circle with a strip inside it. Have no idea what to do with it though. You can't pick it up. anyone a idea what to do with it? I also found that "circle" that looks like a "no-something" sign. No idea about it either. Squirrel King is impossible to reach, the 3 flowers DO NOT give enough lift. I have tried everything I can think of, I always fall short of the platform. I think the not-so-secret area was just a joke saying "ha ha, you climbed all the way up here but you can go no higher, not even with a seed,"
There's an invisible block in the final room, on the ceiling above the final platform; you can find it by planting flowers and riding them up. Is it just a bug, or is there anything to do with it? To the person who can't get to the squirrel king: You get the most thrust from the gust flower the closer you are to it (ie at the bottom of the gust.) Keep trying, and you'll get there! I found it easier to fall into the path of the thrust then release the parachute than to jump and then release the parachute. I Found an owl with some flickering squares behind it(bug?) (It was on a branch at the top of the tree placed at the left border of the room with the x-seed), strangely when I replayed to see if there was something more to it it wasn't there?? Bug or was the location somewhere else? I too have found the owl. You find it at night time at the far left of the screen. The jump to the squirrel king is just too pixel perfect. Games like this died out in the 80's for a reason. People Hated Them. People threw too many joysticks at too many tv screens in pure fury. I've tried pretty much every variation of that jump I can imagine. I was trying for about 30 mins. If (and that's a BIG IF) this is remotely possible it must be literally just only by 1 pixel from EXACTLY the right place. IMHO it needs 1 more fan. You'd then make it. Oh, and it's really bad to make me go ALL the way back to the beginning. No save state? There's no way I'm replaying from the start to get back to a jump I don't even believe IS possible. Especially with the other jump just before it that's also pretty much pixel perfect too. It makes you wonder if people even playtest games any more. If you're in the room that says "Now I can be alone." Just leaf the room. The game restarts which implies that this is the end of the game. This game isn't working anymore. It's not just on this site, either; the Ludum Dare page links to 404'd Dropbox pages, and every website it's embedded on just gives an empty white box.